The Carpet Export Promotion Council is organizing the 33rd India Carpet Expo, a sourcing platform for handmade carpets and other floor coverings, from 27-30 March, in Hall No. 11, 12 & 12A, Pragati Maidan, New Delhi. The Expo, one of Asia's largest handmade carpet fairs, will be inaugurated by the Union Textiles Minister, Smriti Zubin Irani, on Monday. Minister of State for Textiles, Ajay Tamta; Textiles Secretary, Rashmi Verma, other officials and representatives from trade and media would also be present. The Expo is being organized to promote the cultural heritage of Indian handmade carpets and other floor coverings, and the weaving skills of their makers, amongst visiting overseas carpet buyers. The Expo is an ideal platform for international carpet buyers, buying houses, buying agents and architects to meet with and establish long-term business relationships with Indian carpet manufacturers and exporters. 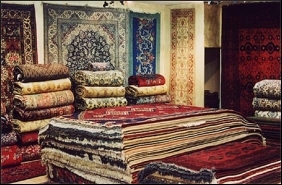 It is a unique platform for buyers to source the best handmade carpets, rugs and other floor coverings under one roof. The Expo has established itself as a popular sourcing platform for carpet buyers from all over the globe. India’s unique capability in adapting to any type of design, colour, quality and size, as per the specifications of carpet buyers has made it a household name in the international market. The 33rd edition has received an overwhelming response from member exporters; 305 exhibitors are displaying their products in the show. Around 410 Carpet importers from 55 countries, mainly from Australia, Brazil, Canada, China, Chile, Germany, Mexico, Russia, Singapore, South Africa, Turkey, U.K. and USA have registered for the Expo. Notably, Bulgaria, Israel, Malaysia, Mauritius, Taiwan, Zimbabwe, Vietnam, Serbia and Hungary are being represented for the first time at the Mega Expo. Chairman, CEPC, Mahavir Pratap Sharma has said that this exhibition and buyer-seller meet will be the first step in taking Indian exports of handmade carpets to greater heights. CEPC is confident that the Expo will generate good business and has requested the media to extend their full support for promotion of the event, so as to facilitate participants in acquiring handsome business.